Well, this trip I attended a living history presentation by Park Ranger Phyllis Wilson. 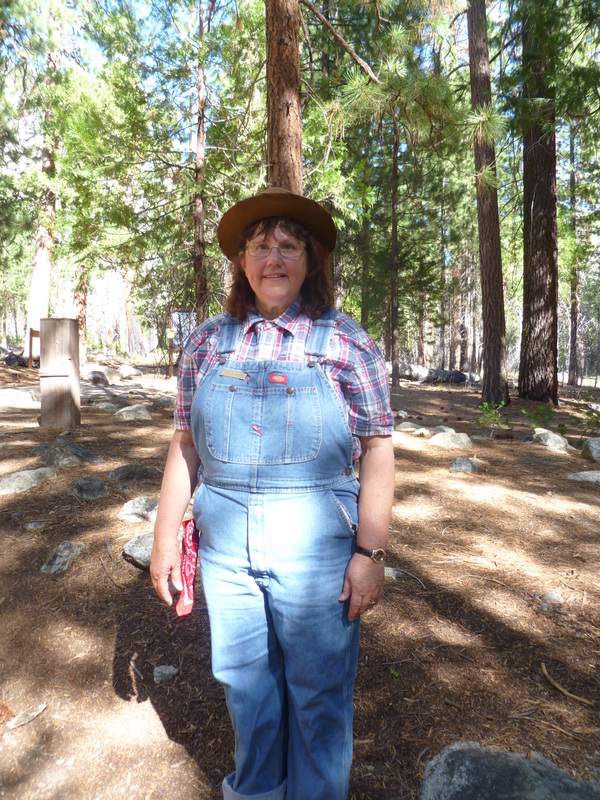 She did an outstanding job portraying Viola Kanawyer, an early pioneer to the canyon. Viola, also called “Auntie Vi”, came to King’s Canyon in the 1880’s with her husband who was experimenting with copper mining. Vi was a hospitable woman and she invited travelers to stay with the family. She could hunt and fish better than any man in the region and, best of all, she was a great cook. Auntie Vi’s apricot, apple, and berry pies were canyon famous. 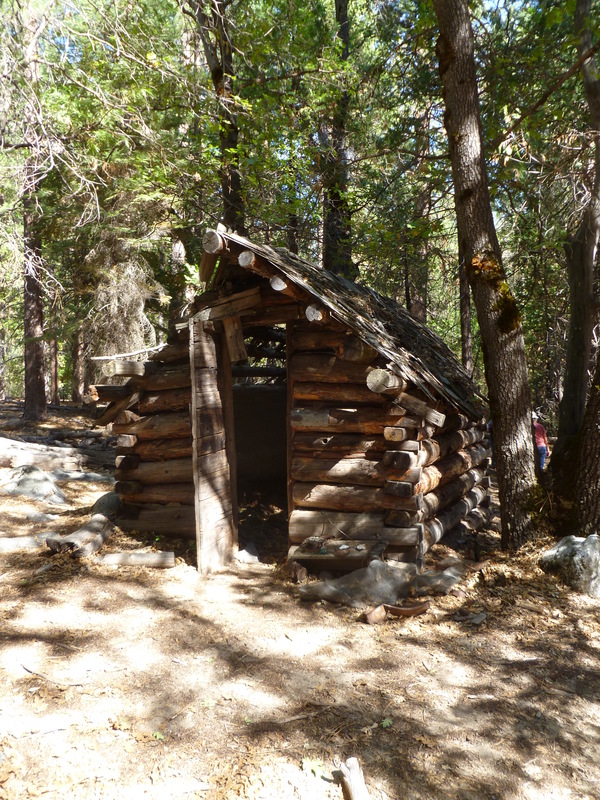 Naturalist John Muir enjoyed visiting the Kanawyers and brought his friends to eat at the cabin. In 1896 the Kanawyers opened Camp Kanawyer, which eventually consisted of a general store, post office, and two story hotel. Mr. Kanawyers opened a packing business (copper mining just wasn’t that profitable) and brought people into the canyon for “adventurous vacationing.” When Mr. Kanawyer died in 1908, Vi continued running the camp for nine years and it was a successful enterprise. Ranger Wilson, who was doing the living history presentation, concluded by reminding us that Viola Kanawyer did not know the importance of her actions. Decades later, politicians wanted to make Kings Canyon into a water reservoir dam, and leading the fight against it were people who had visited the beautiful canyon and stayed at Camp Kanawyer. We don’t know how our simple day to day actions may provide the influence or opportunity for great effects. After the presentation, we took a short walk and saw the overgrown ruins of Camp Kanawyer. I’m very glad I was able to attend this living history program. It gave me a new appreciation for the early pioneers in King’s Canyon. P.S. Have you been to Kings Canyon or another National Park? If, so what was your favorite thing? I like the hiking and hope to do some longer hikes the next time I go back to the mountains. Yes I’ve been there. Imagine if they had made it a reservoir – unthinkable. Got to have a lot of respect for those early outdoorsmen (and women!). I love the hikes there; some of the best around. Yes, I’m also thankful the Canyon didn’t become a reservoir. Thanks for commenting, fly1200. Viola Kanawyer was my great-great grandma. We went up and visited the camp and the copper mine many, many years ago. I wish I had much more info regarding the camp and mine. If you have any info, could you please share it? So nice to hear this information prompted good memories. I took notes during the presentation and I will check those to see if I have another addition facts that didn’t make it in the blog post. May I email you the information later in the week? This is cool I have a friend named Jerry Kanawyer and these are his relatives! My name is Louis Saffell. Thomas Kanawyer, was my grandfather’s brother. His name was Ione Napoleon Kanawyer. He also drove long-line teams into the mountains. I have been interested in learning the exact route that he drove from Sanger up to Millwood. He drove his team in and also packed visiters into Camp Kanawyer . He was famous for his, raisin pie which he baked at the camp. I understand that there was an article about him in “Sunset” magazine. My father and I visited Uncle Tom at his home west of Mirimonte when I was a teenager. I wish I had ask him more about his life. If you have any information, I would like to hear from you. My e-mail address is:lousaffell@att.net. What wonderful family history! Thank you for sharing it. I don’t have more details than what’s in this post. I attended a historical program in King’s Canyon National Park and wrote based on the information in the presentation and short hike. Years ago, probably about 20, we were camping in Cedar Grove and went on a Ranger walk to the Kanawyer Hotel site. The buildings were gone, but there was an area that had rusted tin cans and old bottles that had come from the Hotel rising up out of the dirt. Also, there were two lines of trees planted by the Kanawyers to create an entry way to the hotel and they were prominent at that time. You could imagine a wagon and team of horses driving between them up to the Hotel. Not far from the Hotel was a very small cabin that was said to be a friend of the Kanawyers. A picture of that is shown above. This year when we were camping in Cedar Grove and inquired about the walk to the Hotel site the Rangers did not seem to know anything about it. We did fill out a questionaire and asked about this.We were advised that there is a Ranger named Mel that has been there for 9 yrs. and knows alot about the history of the area. Perhaps if you can contact him he can give you more information. Question: Does anyone know the route to that site? If you come back this summer (2018), ask for me, Ranger Lea. There has been a lot of ranger turnover in the past few years so not many of us know about the Kanawyers anymore but I had a chance to follow Former Ranger Phyllis up there last summer and I’m confident I can retrace our steps. I may be able to gather some information for you as well, or at least refer you to someone with the Kanawyer knowledge. There hasn’t been a formal hike to the hotel site since Phyllis, but I’ve taken some folks back just for fun. Phyllis also showed me some other neat details I’d missed and I’d love to share them! Who knows, the formal programs may be coming back soon! Thank you for your E-mail about the past ranger walks and the Kanawyers. Sorry to be so late in getting back to you. We do not plan to get to Kings Cyn this year, but hopefully maybe next year and would love to go on some of the ranger walks. We enjoyed them so much.in the past. Is Mrs Wilson still doing her presentation about John Muir? Several years ago I was so impressed with her that I almost asked her “what was he like when you met him” luckily I stopped myself before I opened my big mouth. Hope you have wonderful time in the canyon, it is truly a special place. That’s funny! Phyllis retired before I started in the canyon but still drops by from time to time. I’ll have to ask about her John Muir program when I see her next. There’s a ranger in Grant Grove who plays John Muir and he’s pretty convincing. It’s great hearing about all the love people have for the canyon. I hope you come back soon!